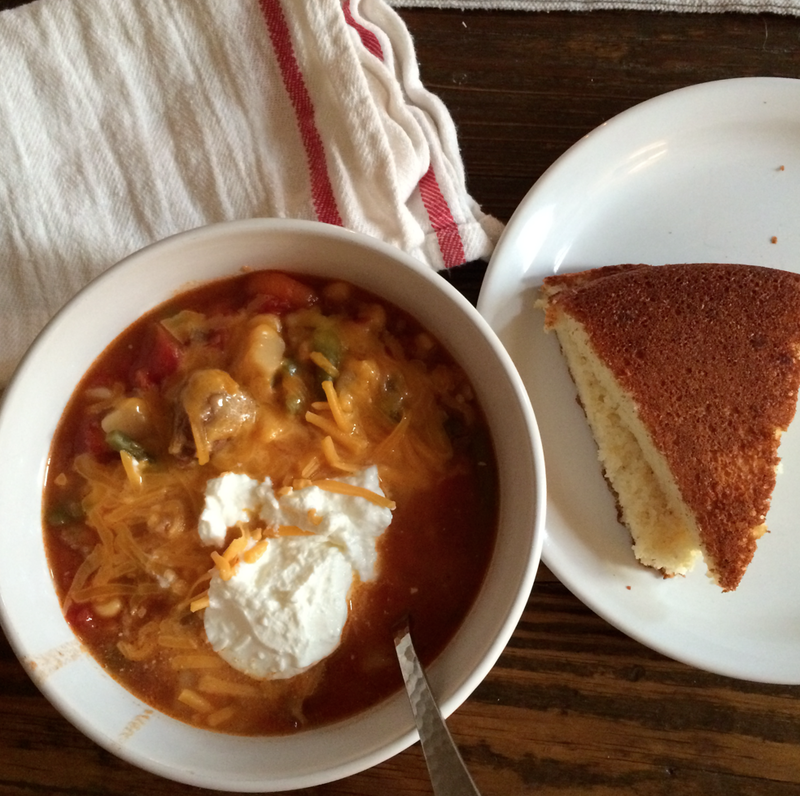 #1,727 Mulch + Soup & Cornbread. – Laurel Mercantile Co.
Now reading: #1,727 Mulch + Soup & Cornbread. #1,727 Mulch + Soup & Cornbread. 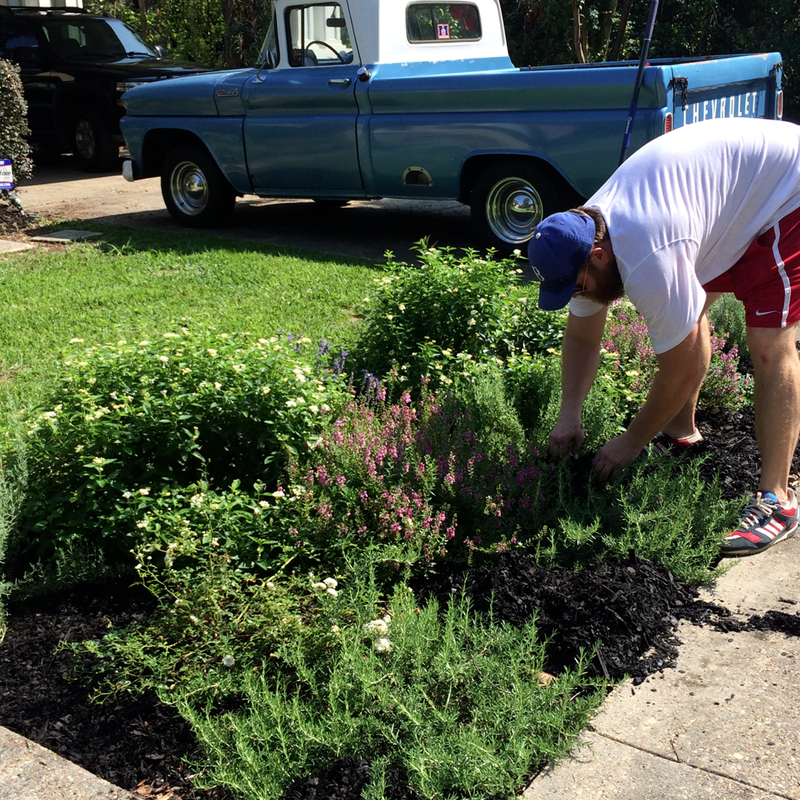 Over the weekend we bought a ton of new black mulch for the front beds to get them ready for fall, but we ran out of time to actually put it out there. 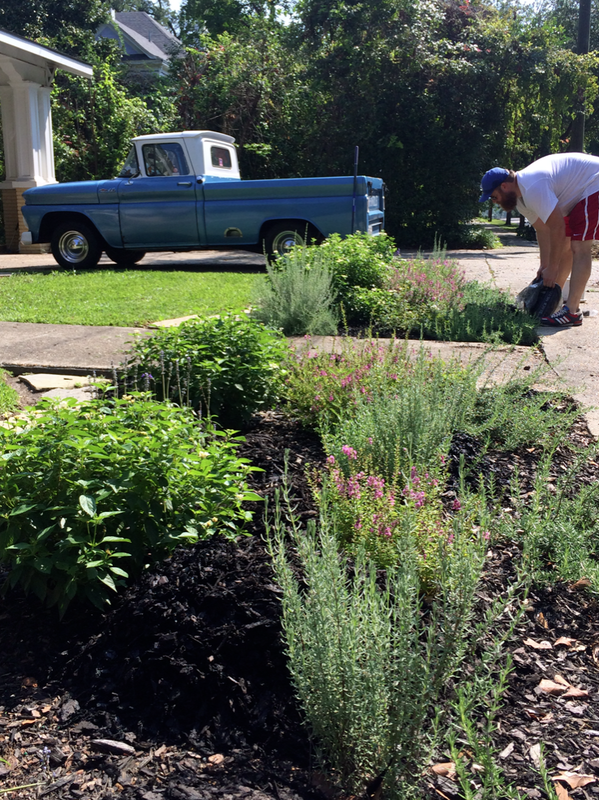 This morning after taking the pups for their walk, we got busy pulling weeds and spreading the mulch and it just really does make a world of difference. Look how much they’ve grown since my first post about them! Been having a hard time keeping my lavender alive. I had to replant them all twice—then they finally took off. Now they’re huge! I love the way you can smell it walking past on the sidewalk. Afterward, I browned some stew beef and gathered up all my canned vegetables to make a big ole pot of Dump Soup. This time I added in a packet of Lipton’s onion soup mix with the spices, and let it simmer in the crock pot from 8:30 am until supper and I think it was the best pot ever. Served with some skillet fried Hominy Grill cornbread, you really can’t beat it. I mean, if the weather had cooperated and been cooler than 90 degrees, that would’ve been real nice but you can’t have everything I reckon. 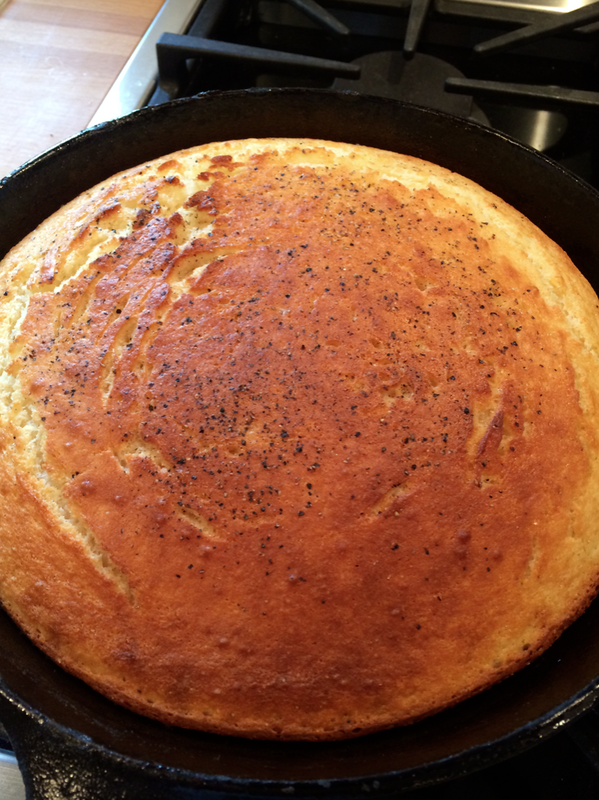 I don’t believe I’ve ever actually typed out the cornbread recipe for y’all before—if this is a repeat, forgive me. But you’re gonna want to pin this one. It’s truly the best cornbread in the world. For you non-Southerners, as long as you can find white cornmeal and cast iron skillet, you too can impress your husbands with your homemade know-how. No Jiffy, y’all. Please. First things VERY FIRST: pour some vegetable or canola oil in the bottom of a large cast iron skillet. About a 1/4 cup (just enough to cover the bottom). Stick skillet in the oven and preheat to 450. Sift (I actually just use a whisk) all the dry ingredients together: flour, cornmeal, sugar, baking soda, baking powder, and salt. Whisk until there are no clumps. In a separate bowl, thoroughly whisk together buttermilk and eggs, then combine with dry ingredients from above. Gently add butter until just combined. Your oven should be preheated by now. Remove the skillet and carefully pour most of the hot grease into your batter and quickly stir it in a little. Pour most of the batter into the hot skillet (it’s important to leave a little grease in the skillet so it makes a crispy fried crust). I actually don’t ever use all the batter—I don’t like to fill the skillet up to the top. The bread will be crispier and butterier if you leave 1/2 inch at the top. Sprinkle the top with fresh cracked black pepper. Place back in oven and bake for 20-30 minutes or until deep golden brown. Serve immediately (this is important! it’s the only way to enjoy the crunchy, hot crust that quickly dulls as it cools) cut into triangles, sliced lengthwise with butter spread inside (if you want to be legit about it). Enjoy this completely bizarre phenomenon—Lucy gets very frightened and angry if you move cushions on furniture. It’s like she thinks you’re hurting the furniture. We’ve tried it on everyone’s sofas and chairs—she’s not specific. Any sofa upsets her. Is this not hysterical? #1,728 Wreath is Up + Business Papers.